Gold coins and bars are a smart way for small-time investors to purchase and invest in gold. It’s a safe way for them to get their feet wet. But, what is the best way to invest, and are there any downsides? There is a ton of advice coming from all angles, and it is hard to sort it out and make sense of it. A lot of it is conflicting. Lawrence Chard’s advice comes from more than four decades of experience, and there is also a lot of reasoning and logic behind it. A lot of countries allow you to import legal tender gold coins tax free, with a few restrictions. Other countries will allow you to import gold bars, as well. In the EU, from January 1st 2000, all gold coins that were mined from 1800 on, and are comprised of at least 90% gold content, are in the category of investment gold, and there is no VAT on thm. Gold bars of a certain weight that are comprised of 99.5% gold are also designated and classed as investment gold. What is the basic advice here? Purchase at the lowest premium you can, within reason of course. What do we mean by premium? Premium is the percentage amount over the inherent spot bullion value. Most dealers will give you better deals if you buy in bulk. Different-sized coins and bars will have varying premiums. If you’re talking tiny coins and bars, then the premium will usually be higher, and it’s sometimes unrealistically high. Timing is crucial. You’ve got to time your buy nicely. Most small-time investors usually purchase only when the gold price is going up, but then it’s generally too late. The price of commodities, shares, stocks, and bonds tends to go up and down. Most investments do. It’s usually a good idea for a dip in the market, or to buy when the price of gold is going down. To some investors, this doesn’t make any sense. But think about the old adage of “buy low, sell high”. What are our top three? Purchase these only if you’re purchasing between 50 and 100 coins at once, when the premium is just a little bit more than Krugerrands. If you buy in limited quantities, you may pay a premium because it’s a collectible or retail item. We’ve talked to some investors who only want Krugerrands because they don’t want to pay that collectability premium. This might be a stupid way of looking at it, though. The actual extra might be very small, but the potential resale price is a lot higher, and they are sometimes very easy to sell. They will generally have a lower premium than the quarter ounce Kruger Rand. Another dumb reason some investors don’t want to purchase sovereigns is because they’re just mentally lazy; they just don’t want to think about it, or they don’t know how to figure out the gold content of a sovereign. It requires a little more mental effort, but the effort is well worth it. Interestingly enough, profits you make from sovereigns are excluded from Capital Gains Tax in the United Kingdom. Number two on the list is krugerrands. This is the quintessential modern one ounce coin. They don’t have a high premium. The South African Mint charges a small 3% premium plus shipping and insurance. But, they only sell to bullion dealers and big banks. There are a lot of competitors on the market now, but krugerrands have been around for a long time, and there is a big secondary market that keeps the premium down. Smaller size Krugerrands were put on the market in 1980, but they usually have a higher premium, and so it’s probably not a good idea to buy them. Everyone’s familiar with gold bars. What is a “small” gold bar, anyway? A small gold bar is any bar that weighs less than 400 ounces. They range from between 1 gram and 1 kilogram. 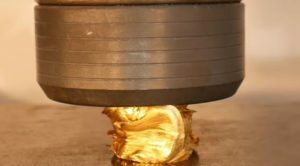 Imagine a kilogram that costs more than $20,000. That’s still a small bar! Extremely small bars less than 20 grams are usually too pricey, while bigger “small” bars like kilogram bars can be really hard to get rid of. Gold bars can usually be purchased at premium almost on par with gold coins, but they may be a little more difficult to sell, and so they may fetch less. It’s primarily for that reason that we put gold bars at number 3 on the list. Market conditions change all the time, and the best purchases can change with them. Follow advice with a healthy skepticism and don’t just carry it out dogmatically. If, for instance, you can get fractional Krugerrands at an identical premium to a one ounce one, then take that deal. You can sell them at a higher premium when the time is right. Some companies may offer better premiums on their choice of gold coins compared to Krugerrands. Those companies might want to balance out their stocks, and those savings might be passed on to customers. You might be able to get a coin for a reduced price, too. The Kruger Rand was invented in 1967, and there were a lot of unique gold coins on the market at that time. There were British gold sovereigns, French 20 francs, Swiss 20 francs, Belgian 20 francs, Netherlands 10 guilders (10 florins), German 20 marks, American 20 dollar double eagles, Mexican 50 pesos, Austrian 1 and 4 ducats, 20 francs, 10 francs, Italian 20 lire. I hope you get the point. There were a lot of different gold coins on the market at that time. Before the Kruger Rand hit the market, a lot of these coins may have had a high premium, but the Kruger Rand had such a low premium and better marketing, so it became very popular. This had the unintended effect of lowering other older coins’ premiums. For example, the sovereign premium used to hover around 40% and now its near that of the Krugerrand. Most of these traditional, old coins can be purchased at premiums very similar to the Krugerrand. It’s ok to pay a little more for collectability, because it will probably get you a little more when you sell. Even though this report is targeted more toward UK investors, the Internet has made it easy to reach investors all over the world. So, therefore, our advice is somewhat international in nature. Investors who don’t live in the United Kingdom may discover that there is a gold coin in their local area that is more easily accessible, or is in high demand. Swiss investors may prefer Vreneli, and American investors may prefer modern gold eagles. Take our advice accordingly. Think about what is locally available. Think about our advice objectively, as well as contextually and locally. There are many other factors specific to the country you’re living, like sales tax, duties on imports, and even embargoes on certain items and classes of items. Australia and Canada charge an import tax on coins that aren’t perfectly pure. This might just be a measure to get their citizens to purchase their own local stuff, but it’s still an important factor to think about. A lot of countries, maybe most countries, currently have a near-zero or zero tax rate on gold marked as investment gold. The EU has that, too. Some countries don’t have it, though. We don’t really claim to know about all tax and import laws in every country on earth. If you want to import coins or bars, you need to look up the relevant laws yourself. You have to time your buy in tandem with how the market is moving, but you also have to look at the big picture. There are a lot of financial analysts who spend their entire lives doing this, and they’re getting paid very well to do it. Still, they do not always get it right and hit the mark like they try. Individual investors can look at investment advice from a lot of different sources. You do want to use your “gut feeling” when you’re making a decision, too. If you use that gut feeling right, then you can tap into what a majority of people is feeling. There are probably a lot of people feeling what you’re feeling, and you can stay one step ahead of the game if you tap into the general feeling out there. If you really feel a feeling deep down in your gut that it’s time to purchase something, then go with that, and get to it before everyone else jumps in. The same advice is useful for when you want to sell. We try to avoid having an obsession with gold, and attempt to take a global view of the market, currently and into the future. At the current price of gold, even though it is moving toward a peak not seen since 1980, we still feel gold prices are much more likely to continue going up than to go down. A lot of analysts out there expect gold to hit new peaks of $900, $1,000, $2,000, and even higher. We think some of these high pries are just too high, but we felt that way back in the 1960s when gold hit $100 an ounce. We didn’t think it would jump from $35 to $100. One more reason for steering clear of gold bars, especially the bigger gold bars, is that if you want to post them to a purchaser, you may find it difficult to get enough postage insurance. In the United Kingdom, the maximum coverage is $2,500 per package, so you can simply divide up a batch of 100 sovereigns into several different packages, but splitting up a bar is a lot harder! It is smart to own small coins and bars, as long as you pay a low premium for purchasing them. If you’ve ever tried to pay for a latte with a $500 dollar bill, then you know what I’m talking about here. It’s a wise idea to stay away from newly issued coins, like proof collections and sets. These usually come with extremely high premiums well above the value of the metal content, and it can be double or more. It’s a much better idea to purchase them on the secondary market a couple years later for a lot cheaper. However, when gold bullion prices go up, the premium on new coin sets can be pressed downwards to the level where they are as inexpensive to purchase as bullion coins, in which case they’re a smart purchase. It’s also a good way to hedge your investment. If gold prices continue to go up, the intrinsic value of the proof set will go up as well. But, if gold prices go down, the coin set will keep its value. It’s either you win or don’t lose. A lot of potential investors approach us with advice they’ve read somewhere else. The advice is bad a lot more often than it is good. There are Canadian websites, for example, that talk about how smart it is to purchase Canadian Maple Leaves. The typical reasons given are that they are “fine” gold. There isn’t really any value in purchasing “fine” gold that is more than 22 carat. We think this advice was given because the dealer just wanted to push something on you. There are lots of dealers who give that kind of advice. There is also a lot of inexpert advice out there. Some of it is good, but a lot of it is ignorant and poor. Silver doesn’t have that same VAT exemption like gold does. Gold jewelry doesn’t either. In the UK gold coins and bullion have substantial tax benefits if you put them in a Self Invested Personal Investing Scheme (SIPPS). However, you get some of the same benefits for ETFs, whether they’re for gold or other types of commodities. You can purchase gold smartly by getting shares in an ETF. There has been some discussion about owning physical gold that will be near-equivalent in cost to owning gold in an ETF, but that hasn’t occurred yet. When purchasing gold coins or bullion, unless there is an off chance your bank deals in coins, you’ll probably be purchasing from an unregulated dealer. However, there are some very trustworthy dealers of bullion and coins, and if you take the normal precautionary steps for any big purchase, you should be just fine. The first thing you need to do is find out how long they’ve been operating and if they have any references. If they’re a good company, they’ll be happy to provide them. You can purchase gold bars from a bullion dealer in a narrow range of sizes from a few ounces either at their store or online. The price is fixed two times a day once in the morning and afternoon, and dealers make their money from the margin between purchasing and selling prices in addition to their trading premiums. This website is an excellent source of information on all gold bars produced: www.goldbars.worldwide.com. You can also look at the website www.taxfreecoins.co.uk, which has plentiful information on current gold bullion coins with current price information and basic information on quality and grades. Another good website is www.thebullionvault.co.uk, and it sets up the purchase and sale of remotely stored gold, and it has an economic dealing, storage, and insurance service as well. They keep the gold in highly secure vaults outside of the banking system. The Bullion Vault service has an online trading platform with current prices with immediate execution at a price that includes all the costs.